It has been a strange few months of both exterior success, and inner disgruntlement, at our local Legion. Rumours have flown regarding hostilities between a number of the executive and Legion members, and last week the iconic Royal Canadian Legion Killarney #25 was suddenly closed up and locked tight, by a departing staff and executive which had resigned in protest. Taylor, who served as Killarney Legion president from 2001 until 2015, said he couldn’t believe the upheaval that was taking place between the disgruntled members. Taylor said that all 150 members of the Killarney Legion received a letter last week, sent from Manitoba and Northwestern Ontario Provincial Command. Complaints had been filed back in February, said Command in the letter, about the local Legion president, Comrade Kirk. After investigation by the Complaint Committee she was found guilty on two separate breaches of Legion by-laws, and cleared on a third charge. This finding is what led to the emotional Legion executive and staff walkout last Tuesday. To continue operation, Taylor, along with other Legion members Jack Garabed, Rose Choquette, and Gale Collinson (Command member from Souris), were immediately appointed by the Provincial Command as trustees for the Killarney Legion, and put in charge of handling branch affairs until the upcoming election, said Anderson. “The board of trustees is running the place for now,” said Taylor. And one week later, progress had been made. Skrypnyk, along with clubroom supervisor Bonny Kobialko, were busy this past Wednesday morning at the Legion Clubroom, hauling in fresh cases of beer, and lifting out the empties to Gardewine employees, using a small hatch door up near the ceiling in the basement clubroom. Kobialko said there was quite a flurry when the open sign went up outside the previous morning. Skrypnyk added that the revoking of the Liquor and Gaming Authority of Manitoba license would hopefully soon be reversed. Both the Meat Draw and the 50:50 events are also on hold until the license is renewed, she added. The separate liquor license for the bar is still valid, added Skrypnyk, which is why the celebratory drinks in the newly refurbished clubroom have been pouring for the past few days. “Our VLTs are okay, and our liquor license is okay,” she said. In the meantime, other events scheduled for the Legion and Clubroom are reportedly still on schedule, including upcoming socials, they said. 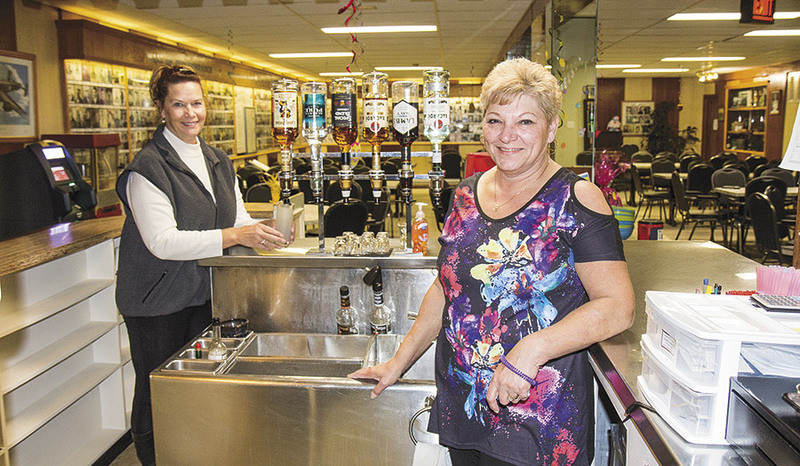 READY TO POUR AT THE LEGION CLUBROOM – Legion manager Colleen Skrypnyk (right) and Clubroom supervisor Bonny Kobialko (at the liquor dispenser) were busy in the attractive clubroom bar on Wednesday morning, following re-opening of the facility the previous day. A board of four Command-appointed trustees is currently handling the branch’s affairs, until a supervised election is held next month to elect a new executive for the Killarney Royal Canadian Legion #25.